THE ST.CLAIRE » Why Are We Going Wherever We Are Going? Polished. Danish office. Jungle? Maybe. Waiting room of a Danish dentist. Yes. Too designed. But then maybe that’s the point? I’m supposed to think about offices and design in relation to nature, the role that nature plays in our overly designed, polished, first-world lives. We use nature as inspiration, but then all that’s left is the facsimile of nature that we’ve made, because we stomped the real thing into the real ground. Yes. 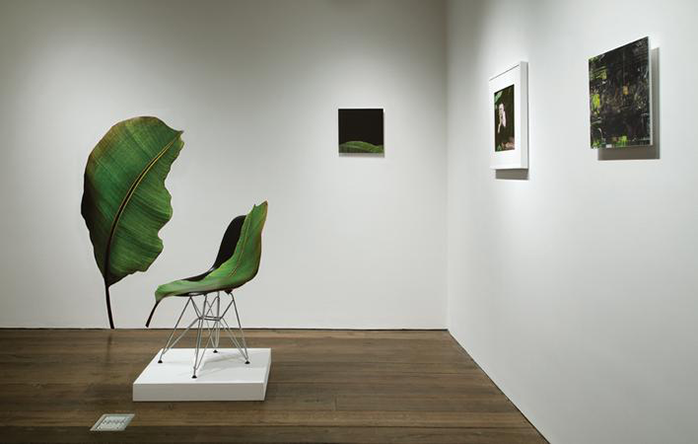 But why is there a gigantic leaf draped in this office chair? Or that other leaf, curving gracefully in conversation with the chair, dancing on the wall? The scale and placement personifies and adds playfulness. Wait, is this supposed to be funny? It’s too sterile to be funny. But maybe that’s funny. The monkey, too. He’s just so cute. And the mystical horse? The horse isn’t in the jungle. I must be going to different places. What’s the title? Traveling Into View. Right. The images are all spaced apart like frozen views from a window, rolling by, partitioned. I must be staring out of a moving vehicle, doesn’t matter which one, plane, train, automobile. The very first image in the show, mounted high up with acknowledgment of the end of the wall, indicates a plane is my portal. The way the sky portion of the image hangs out over the open air in the absence of the terminated gallery wall, that’s one of the strongest, most thoughtful decisions in this show. Then, further down the wall, the horse, that majestic horse, is viewed through a car windshield. So yes, a plane, then a car, ultimately taking me to the back room of the gallery, the Danish dentist’s office. This movement is interesting, this shift from cluster to cluster of related images. Leaf cluster, horse cluster, solitary monkey, another leaf cluster. The sharpness of the edges, the physical sleekness of the material and the glossy high-fashion finish of the images, evokes a feeling of stylish (and styled) living. Maybe I’m on a trip highlighted in the New York Times Travel section, or detailed in Travel and Leisure magazine. No, I’m in the office of a dentist who went on an amazing trip, and then hired a designer from Dwell to install her vacation photos in the waiting room. I would not be friends with this dentist. She’s too eager to prove how well-traveled she is, how good at design. The leaf occupying both wall and floor as it folds form one surface to the next screams art school at me. Look, just because I’m a photo doesn’t mean I have to live on the wall! Look, I can be on the floor too! So can my frame! French artists at the turn of the century would order the standard sized strainers on which to paint a portrait, but then flip them ninety degrees and paint a landscape instead. This was considered radical, a subversive gesture. The leaf photo feels about as impactful as that French idea does to us now, except with less intentionality than Renoir and Cezanne had back then. I am drawn to the photograph of the leaf, the high quality of the print and the attention to detail shown in cutting it out. The approach to installation could be worked on, but the vividness of the various leafy greens contrasting with the stark white walls of the gallery is seductively striking. Remember the sandwich game? It’s the one from camp where you have to say one positive thing, then one thing the person can work on, followed by another compliment. I get it. I get the hints of awe at nature, the desire for discovery, but the wonder I want to feel on this journey is lost in the distance created by the sterile sleekness and overt arrangement of the spaces. I don’t know where I’m going and it feels like someone is trying too hard to get me there. Allison Hardt is an artist who loves to write. She is a graduate of Boston University and Tyler School of Art, and is currently based in Philadelphia, PA. Find her on Instagram (@alhardt) or on her website.